1. Wedding photograph, bride arriving at St. Mary's church, Blenheim (St. Patrick's Hall is in the background). James Shaw with his daughter, Kathleen Lucas Shaw. circa 1930s. 2. 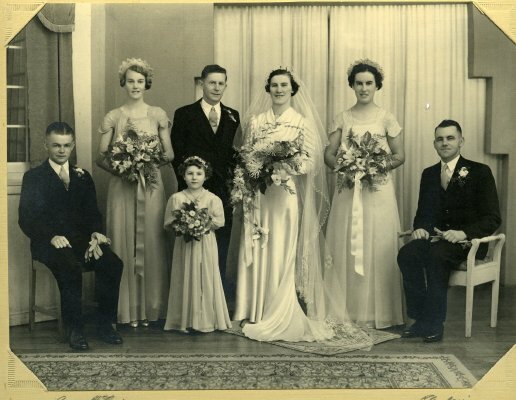 Two wedding photographs of Doug Lucas and Kathleen Shaw, Blenheim. 3. 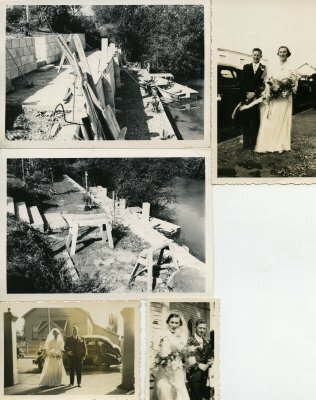 Two photographs of building work at Wayne Lucas's property on Budge Street. 4. Studio portrait of Billy Mancer as a toddler, circa 1950s. 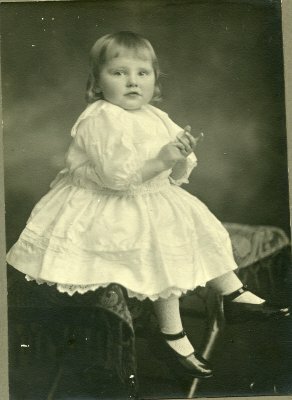 Inscribed on the back of the photograph: "To his God-parents, with love & best wishes, from wee Billy. 1 year, 11 months." 5. Studio portrait of Grace Kirby, circa 1910. Photographer: Macey, Blenheim. 6. 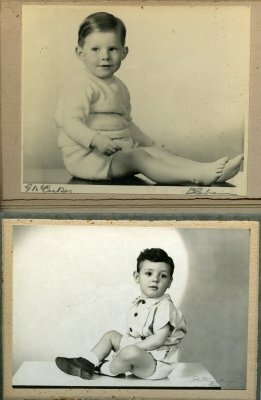 Studio portrait of Wayne Lucas, as a little boy, circa 1950s. Photographer: McCusker, Blenheim. 7. Studio portrait of Kathleen Lucas (nee Shaw), circa 1900-10. Mounted on grey card. Photographer: A. McCusker, Blenheim. 8. Wedding photograph of Doug Lucas & Kathleen Shaw, standing on Church porch steps with man & small boy on left. 9. 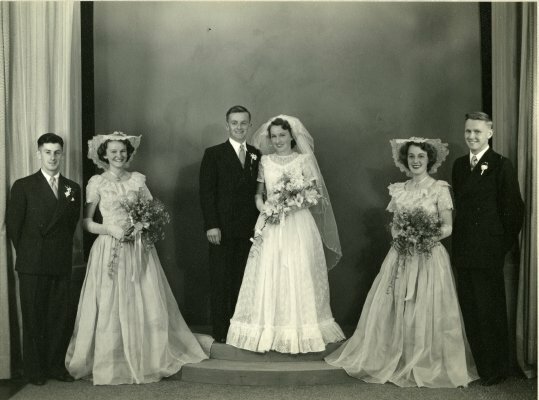 Formal photograph of the bridal party with bride & groom (Doug Lucas & Kathleen Shaw), bridesmaids, flower girl and groomsmen. Photographer: Gordon McCusker. 10. Black & white photograph of Dawn Mitchell, at Heather-Anne Pratt's wedding, St. Andrew's Lodge, Blenheim. 11. Two children sitting on a Suzuki motorbike, believed to be the children of Julie Matthews. 12. Don McIntyre, Kaikoura (South Bay? ), opening a bottle of beer on a fence post. 13. Mac Macarthy holding a tennis racket. inscribed on back of photograph: "the reporter & wag"
14. 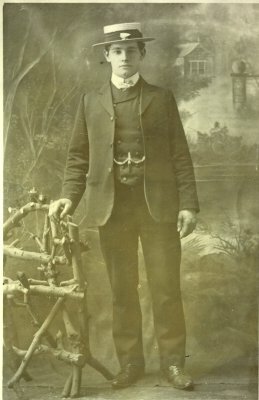 Photograph of a man, believed to be J. McKintosh, the second husband of ? Gentry. 15. 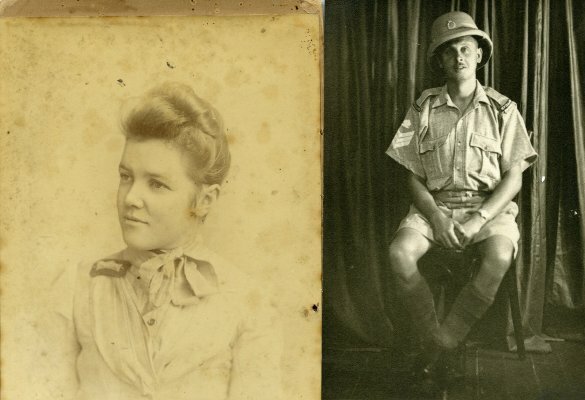 Photograph of two gentlemen and a young woman sitting. ? ; Vera Murphy; Mick Murphy. 16. Postcard photograph of Harold Neal. 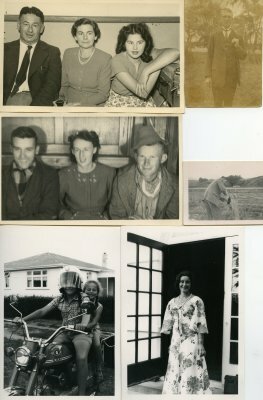 Inscribed on back of photograph: "Taken July 1942. Xmas greetings from Harold Neal, 01.09.42." Photographer: Studio Victory, Royal Arms Photographs. 17. Studio portrait of May O'Sullivan. May married Kind Riley who was killed in 1914-1918 War. Inscribed on front of photograph: "Sincerely Yours, May". Photographer: Oakley Studios. 19. Ben and Jean Potete and daughter Jo. 20. 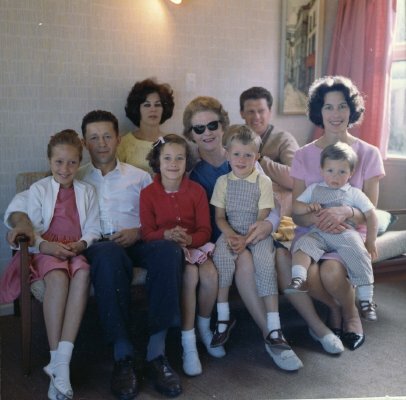 Family group photograph, circa 1960-70. Marie Potete is on the left. 22. 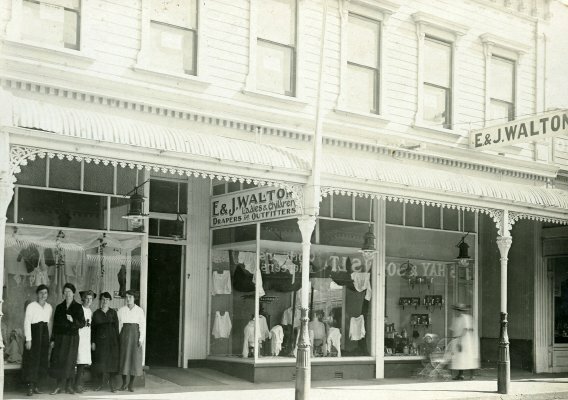 Black and white photograph taken outside E & J Walton Drapers (Market Street South, Blenheim), with 5 women standing outside to the left of the door, circa 1910-15. There is a lady pushing a pram on the far right. 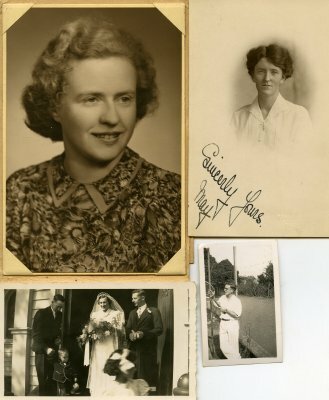 Noted on the back of the photograph is: 'Murphy left, Viggars right"
23. Roy and Bob McFarlane taken out at Bob's place. They are doing some work on the farm. 24. Postcard photograph of Robert McFarlane in uniform. 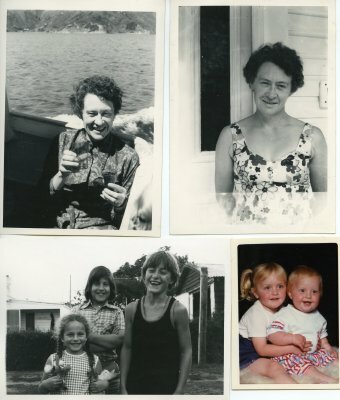 Inscribed on the back of the photograph is: "To Aunt Laura, from Robert." Address is noted as " Private R.L. 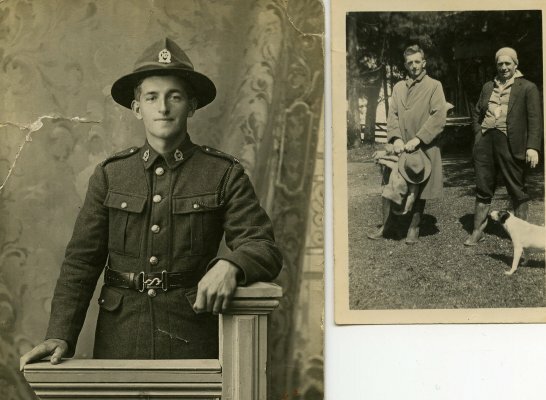 McFarlane, 35 Reinforcements, A Company, 70059, Trentham N.Z., 4 Platoon." 25. Studio portrait of a young man, in a suit and wearing a boater (hat). Possibly Roy McFarlane. 26. Photograph of Kylie and Jonathan March, 1990. 27. Black & white photograph of 3 children. Donald March is on the right. Julie Matthews children. (see also #11 above). 28. Two black & white photographs of Julita March (nee Roussel). One photograph is of Julita outside, standing beside a door. The second photograph is of Julita sitting down on the back of a boat, holding 2 glasses.